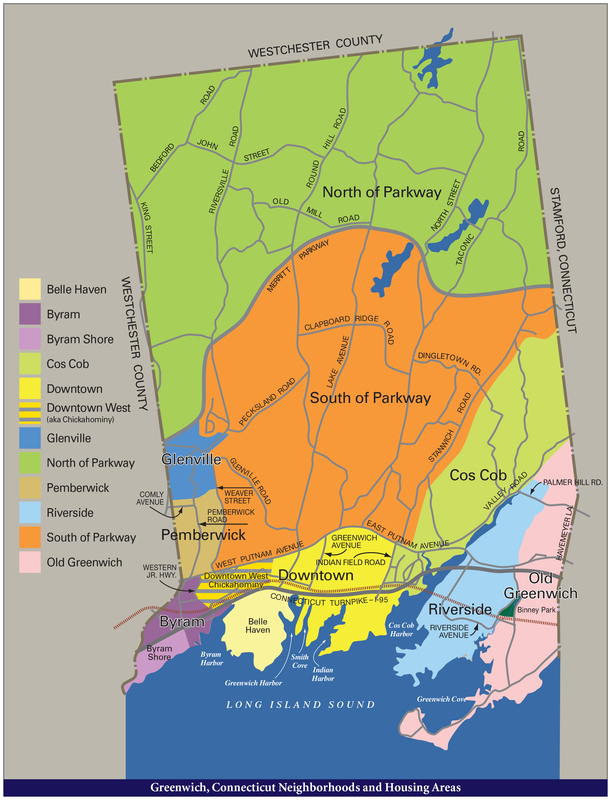 Geography and size: Downtown Greenwich is popular for those who like in-town, high-density, almost New York City-style living. Geographically, Downtown encompasses all the neighborhoods south of Putnam Avenue from the eastern end of Millbrook to the west side of Field Point Road, including all points down to the end of Steamboat Road and Indian Harbor and Mead Point. Downtown West, a.k.a Chickahominy is a smaller geographic area set between Downtown and Byram. Parks/playgrounds/marinas/beaches: There are six parks, four playgrounds and four ballfields in this region affording a large number of recreational opportunities. The parks include: Bruce Park, Great Captain’s Island, Havemeyer Fields at Greenwich Common, Island Beach, Jaycee Park and Roger Sherman Baldwin Park. Ball fields and playgrounds are available at Bruce Park, Havemeyer Fields and Greenwich Common, Julian Curtiss School and William Street Park. Tennis courts are located at Bruce Park, Greenwich High School and other area schools. There is public marina with slips for up to 300 vessels at Grass Island while the closest beaches are those accessible by ferry at Island Beach and Great Captain’s Island. The beach facilities require a beach pass and tennis facilities require a tennis pass. Membership clubs with facilities: Set in Downtown is the Milbrook Club and Indian Harbor Yacht Club, the area’s only two private membership clubs with facilities. Shopping and restaurants: In this section of Greenwich there are some 200-plus apparel and consumer goods and variety stores. Several dozen restaurants and food services businesses make up the cuisine landscape of the Downtown community offering formal and casual atmospheres. Food stores in the area number three, Whole Foods, Stop and Shop and Food Emporium. Transportation: Downtown Greenwich is the home of the community’s most active train station, the Greenwich Station. This station is also home to Greenwich’s only taxi stop, Greenwich Taxi. Interstate 95 and Exit #3-Arch Street is located within Downtown and East Putnam Avenue (Route #1) is close by. Within Downtown there are two bus stops, one at the Greenwich Train Station and the other at Mason Street and East Putnam Avenue. Connecticut Transit, which operates the bus service to Stamford, Connecticut or Port Chester, NY. Travel time to mid-town Manhattan, no matter the mode of transportation, is between 35 minutes to 55 minutes away. Neighboring Stamford is no more than 15 minutes away.